r a m y h a n n a . c o m: Sketch-Up to 3DS Max does work! • Modeling in Sketch-Up is darn fast. I don’t care how fast of a 3D Max modeler you are, anyone who knows sketch-up well will beat you every time! • Sketch-Up keeps the mesh very clean. You can push and pull walls all day long, and your mesh is exactly what you see. The geometry is super light. • Materials transfer from Sketch-Up to Max. There’s no need to reapply materials after importing your geometry. There are great tools (paint bucket + shift / ctrl / alt) for coloring geometry that saves plenty of time and is much faster than changing ID’s or shaders. I could go on, but look into Sketch-Up. Before you purchase the Pro version, you can download the free version and try it out. The free version has everything the Pro version has, except for the export options (which you will need if you decide you like this method). Alright enough of the sales pitch, let’s jump into the process. It really all starts with sketch-up and understanding how the materials work. When you create geometry in Sketch-Up, it has a default material. You will notice that the default material is white on one side and purple on the other side. This material is showing the direction of the normals, so white should be the front and purple should be the back. This is very important. When you import your model into max, only the white sides will render. So as you model be sure the faces are white. To get your faces in the right direction, select the face, then right click and select reverse face. If you have the default material on the geometry, you will notice the purple will change to white and vise versa. After coloring your model, you can always go back to view the normals by changing the face style of the model. This is helpful when a Sketch-Up model is already textured, but you want to flip the faces. Note, you will have to re-apply the material to the newly flipped face. Now that our scene is modeled and colored let’s talk about exporting. With Sketch-Up Pro, you can export as various formats (3ds, dwg, vrml, obj, etc). I typically export as .3ds format. Before you hit export, let’s look at the options button. Every export format will have different options, but I will only discuss the options for the .3ds format. You can change Export to 4 different types: Full hierarchy, By layer, By material, Single object. The only two that I recommend using are “By material”, and “Single object.” And of those two, I prefer “Single object”. If you export with “By material” sketch-up will break your model into different meshes according to their material. So you may have one object in Sketch-Up, but when you import the .3ds into Max, there will be a mesh for every material. 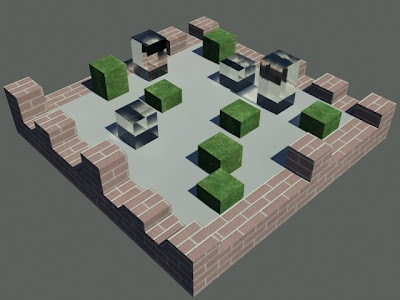 This doesn’t just make a mesh for each material, but it creates a mesh for each material being surrounded by another material, so even though you only have one brick material, for example, you may have several meshes with that same material. The advantage of this method is that you have one shader for each material. So it keeps your materials simple. The disadvantage is that it may take longer to export to .3ds, and in Max your viewport may be a little sluggish if your scene is large and complex. If you export with “Single object” Sketch-Up will export your entire scene as one mesh, and with that one mesh it will create a multi / sub-object material with a shader for each material from Sketch-Up. Because there is a limitation in the .3ds format that meshes can only have 65,536 vertices and faces, if this limit is exceeded, more than one mesh will be created with the emphasis on keeping the number of meshes to the minimum amount necessary. Here’s where this one gets a little complex though. Because every mesh has its own sub/object material, you may have some sub shaders that have the same material. A good trick is to clean these up by making them instances of each other, before you start tweeking them. The advantage of this method is that the scene no matter how much geometry there is, is incredibly fast and efficient. This, as I already said, is the method that I prefer. The disadvantage is that it does take some time to go through the mulit / sub-object materials to make sure that there is only one copy of each material, and the rest are all instances. These are the only export functions I will cover now, but the image on the left are the settings that I usually use. Now let’s talk briefly on importing the .3ds file into Max. Use File-> Import. It will first ask you if you want to Merge with the current scene, or replace the current scene. I always merge with the current scene. I also always uncheck Convert units (I do all of my Sketch-Up modeling in feet and inches). This will keep the real-world scale. It will also ask you if you want to change the animation length. I always say no. Now your Sketch-Up model should be nice and tidy in Max. I think it’s important to state this even though to many max users this may be obvious: Just because your material editor is empty does not mean there aren’t any materials in your scene. There is no correlation. The material editor is just a holding place to tweek your materials. If you open the material map browser, this window will show you what you have in your scene, and you can add that to the material editor. You will notice on the image on the left that there is one multi / sub-object shader, that contains the 4 materials that we created in Sketch-Up. So there is no need to apply the materials…they’re already applied! I usually use Arch&Design materials, and I always add a UVW map modifier to my meshes. I use Real-World Map Size, and adjust the scale of my maps in the shaders accordingly. That’s it! I know this was very exhaustive, and sounds complex, but the process is truly quick and simple once the understanding sinks in. I hope that now you all know that you can model in Sketch-Up and imported beautifully into Max. Stick a fork in me, I’m done! This is some great information. Thanks. Could you do a small bit about glass fo buildings/curtainwall? Im having a difficult time with glass on my building. I either see in too much or get blurry glass. The Glass on the Huston Comm College is great. Any tips? I have a little something to add here. I truly agree with your statement that modeling in Sketchup is a breeze and much much quicker, cleaner, & easier, and I have been a MAX user of past 6 releases (Max 6 - MxDs 2009). Max simply cannot compare to the ease of creating, NAVIGATING & then EDITING models. There is no question about it. The best approach I follow is: Model in SU, get Arch+Des materials/shaders from Max (ASGVIS.com has a Vismat converter plugin that makes Sketchup materials from MAX V-Ray ones). & Then render in Sketchup itself. So my advise would be to go to MAx only to get some of those 'fantastic' Arch+Design materials, and then come back to SU for rendering in V-Ray for Sketchup. good point, as long as you have a spare $500 for V-Ray for Sketchup, sure. Sad as this would solve all my issues. thanks for the comment. I somewhat agree with this comment, and I have used the v-ray plug-in for sketch-up. It's very impressive, but limited. Lights can only be controlled so much dealing with ies files and attenuation. If you wanted to render AO passes, or z-depth passes, then you're out of luck, and if you really wanted to animate something (secondary animation), then you have no choice but to go to max to do these things. I agree though, I was surprised to find how fast v-ray in sketch-up is! If the modeling power of sketch-up could be combined with the rendering power of max, that would be the ultimate program in my opinion. Thanks, this info has been really helpful. I'm trying to take a quite complex timber frame house model into Max and create an animation of the frame coming together and then the cladding moving in from the sides to complete the building. Do you have any idea how to export from Sketchup so I can retain the 'groups' I have created ? For example I have a load of timber floor joists that I want to keep as one group so that I can easily move these when compiling the animation. Currently there is not a way to export from SU into Max retaining the groups/components. A work around solution: If you export as single mesh, in max if you edit the mesh and choose select by element, it will remember the groups/components as elements, you can then copy these as separate meshs. If you export by material, in max you can group each mesh that you had grouped in SU, then move them around. Hope that helps. hi i was wondering if you could give me tips on how to model, in school we usually work on complex models..
so i could render in max? There is no reason to explode anything from sketch-up for it to import into Max. Model as much as you can in sketch-up until you think it might be easier in Max. There are alot of models that are easier to create in max by taking advantage of modifiers like sweep, lathe, shell, bend, wave, etc. sorry if i ask too much questions...please forgive me for that.. I just learnt how to use 3dmax, we were taught all the basics of modeling in a crash course and using mentalray/lighting for a peice of coursework due in for a digital architecture module. When it came to modeling though the whole selection process seamed slugish and i spent two weeks producing a pretty terrible architectural model for a piece of coursework for two weeks time. So i decided to create it in sketchup, took 2 days to model the whole thing in precise detail which is something i just couldn't get my head around in max, and i'm using max to render after i export it. Although i've been exporting it as a dwg file with each material i want to render being on a different layer. I.e glass, Floor plates,Carpets. Max is brilliant for rendering when the mental ray is used and partically in animation it comes into its own. But the modeling and selection interface is horribly slow. Thankyou for the article and the modeling tech, i'll use it for anything done in the future. "Now that our scene is modelled and coloured..."
How did you convince the red colour to turn into brick? "...that contains the 4 materials that we created in Sketch-Up..."
I see them - but how did they get there? When I follow your tutorial and export as instructed, the material browser is empty, the textures are confused and projected in the wrong direction, or missing. I hope you've missed a few steps! The only thing you've told me is how to export, and to make sure that the normals face the correct way..
For your first question, when I assigned the red color in sketch-up, it is just a placeholder for what I later changed to a red brick. For your second question, when you import the geometry, it also imports the multi/sub-object material. Even though you can't see it in the material editor, it is still in the scene. Use the eyedropper button in the material editor and select your geometry to pull it up in one of the slots. When the mesh is first imported the materials in max are just colors from the materials in sketch-up. I changed each material to create the texture I wanted in max. Hope that cleared some things up for you. Having imported my sketchup model into 3D Max it comes in as a block (aka individual faces cannot be edited) I have tried mesh edit, explode the usual thing however none seem to work help please! Are you importing it as a .3ds file from Sketch-Up? If so it should already be a mesh, and you should be able to select the face or element buttons in the modifier tab to edit your mesh. "render AO passes, or z-depth passes,.."
what is it??? i'm currently using 3dsmax...i saw that texts and don't understand what's the function of it..
this is a huge help for me... thanks! what if i want to change materials once exported? Do you know how to export things from sketchup that have images projected on them and keep the images in tact? the images i have projected onto my sketchup blocks are jpegs and every time I bring them into max, it says there is a file link missing. Thanks. My SketchUp users always tell me of the people on blogs and forums not knowing of our SketchUp 3D conversion system, so let me make it more publicly known. 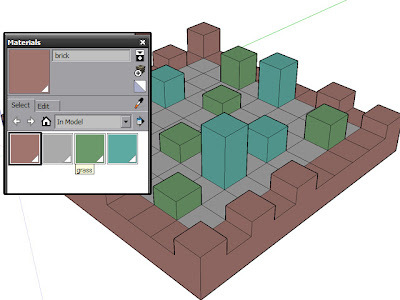 When combined with PolyTrans-for-Max (http://www.okino.com/conv/pt4max.htm), you will get native SketchUp <--> 3ds Max, including support for texturing, hierarchy/components, materials, etc. Ditto for supporting SketchUp to/from Maya, Lightwave, XSI, Cinema-4D, Collada, FBX and all other formats and 3D programs. 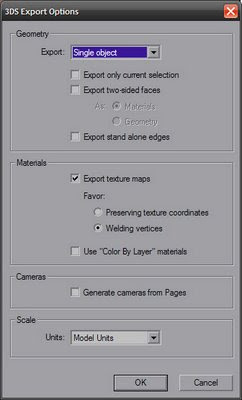 if you want to keep the UV's of your textures intact from SU to Max, check "Preserve Texture Coordinates". This favors the UV's to the smoothing groups. if i have placed materials in sketchup (concrete tiles, bricks,etc..already with their correct orientation, tedious work! ), will 3dmax recognise them, if i export the file to render there? the materials will import into max, but not the correct orientation (uv's). You can fix this by applying a uvw modifier to your geometry in max. hi ramy! first of all i would like to thank you for your wonderful work.. im a sketchup/3dsmax user and you enlightened me with things i cant do.. but i do have a question though.. you said that you applied a UVW mapping in ur messhes.i did exactly what your example said. but there seem to have a problem with my model.. i applied the uvw map in the whole model and the top part of the cubes(brick) where not properly positioned. am i wrong? do i have to apply uvw map on all the mesh and not on the group? you may have to move the uvw modifier gizmo, so that the bricks line up. You can also offset the texture map of your brick material to make it fit. i render my sketchup model in 3ds max 2010 (after importing 3ds file),there's no shadow rendered. how to ON it? this is my first time to use 3ds max.before this i used kerkhythea for rendering. Hi, maybe it is a naive question, but I am trying to render a sketch up model with vray but it is working very slowly. Can it be a problem of hardware parameters? I have a pc with a processor Intel core 2 quad cpu 2.4 ghz and 3.25mgb RAM. Is it enough? Do I need higher parameters? thank you ramy for yours share knowledge. I am vray user, but maybe you can help me. I always put two faces for glass (one extruded face, exactly parallelepiped) In sketch Up, and I want to know how to orient mesh side, I wants to use import model for exterior and enterior rendering, and Is that made some different, I always export models with two sided materials settings checked. I did some work right now, and I got some strange reflections on my glass elements. than I try to fix it, and put reflections to 0 percent in my material slot, but it stil doesnt work fine, Maybe my glass material isnt good enought. Maybe you know how to fix that and if you can help me to find good glass material. Thanks in advance. If you don't have the new Connection Extension Installer for 3ds max Design 2010 you can't import sketchup files. The Connection Extension is at this moment only available for Subscribtion Customers. I think in the Version of Max 2011 it will be implemented for all customers. But you can export as 3ds-file from sketchup. 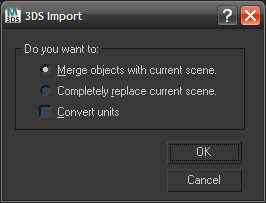 And import that 3ds-file in 3ds max. Unless.....you don't have SketchUp Pro. I think the normal free Sketchup can't export as 3ds-file. i put the color and the names on sketch-up, exactly the same as what u did. do u have any idea?? I WAS WONDERING IF YOU WOULB BE ABLE TO HELP ME, IM DOING ARCHITECTURE HERE IN AUSTRALIA AND I WAS HAVING A LOOK THROUGH YOUR BLOG AND I MUST SAY YOU HAVE ALOT OF GOOD WORK ON HERE, SO I WAS THINKING IF YOU USED 3DSMAX TO EXPORT TO CRYSIS GAME ENGINE AS IN DOING A REAL TIME INTERACTIVE ANIMATION BUT THE PROBLEM IM FACING WITH 3DSMAX THAT I HAVE OVER 200,000 POLYS IN MY MODEL IS THERE ANY WAY TO EITHER REDUCE THE POLYS OR SPLIT THE MODEL UP IN PIECES TO EXPORT BECAUSE CRYSIS WONT ALLOW ANYTHING ABOVE 10,000. THANKS FOR YOUR TIME AND CONSIDERATION. If you would like an easier way you can try SimLab-Soft new plugin which allows importing sketchup models to 3DS Max 2009 and 2010. I am doing modeling in sketchup and when i import into 3ds max 2010 it comes in but without the materials, and when i open material editor there is no sub/multi object...i followed the instructions so maybe its different in 2010? Any help would be much appreciated. Thanks! Thanks for sharing this info, much appreciated. thank you sir may God Bless u . Thank you fro sharing th einformation. thank you for taking the time to share this information, i have been trying to light my sketchup models forever. i love the materials, textures and lighting effects you one can get from 3ds max but modeling in sketchup is so much faster!!! good advice, iv been doing this using dwg exports but think i might change to 3ds after seeing this, looks a bit quicker. Im currently doing a project with a lot of curves, and the down side is in 3dsmax the turbo smooths dont seem to work, and some wierd results happan on radiosity lighting, wondered if u had any tricks up sleve for exporting curved geometry, save me working out how to do it! scratch that last comment, just did a 3ds export and curves are sweet, seems i have been wasting alot of time over the past 5 years with dwg exporting, thanks again for the advice on this page, and sketch up to 3dsmax is 100% quicker than any other method out there. thank you for the information, but i have a little problem here, when i'm trying to export the sketchup file to 3d max, i don't see the 3ds option on my exporter plot. only colada file (*.dae) and google earth file (*.kmz) are appear. another advantage in 3ds is the better quality for objects like trees, furniture and other things you can add to your scene. 3d warehouse is a great idea and really helpful, "but you can't always get what you want"
Amazingly easy. Works like a charm. Thank you very much, Ramy. well it seems all of u makes this work? i can import the mesh to 3ds without problems and all the faces r right set up. but when i try to meshmooth the object it just f u cks everything up. only thing that works is a single square..wich becomes a perfect round ball..but if u pull out a few sides on the square in SU the meshmooth doesent work annymore ( is there some settings or prcedures u can give me here plz? have all folks tried making your models through cad program? Ramy, Great Weblog! Thank you. I have a question, I have done all the things you mentioned. 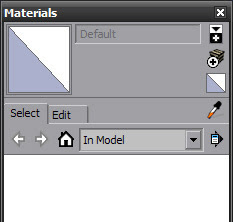 but when I open my material Editor I do not know how to see the color categories I made on my model. Would you please help me a bit ? Thank you - my email is rahamoj@hotmail.com and I will check the blog as well. Thank you in advance!!! hello sir, i am very used to with sketchup and vray, but recently, I need to animate objects like flying curtains, opening doors, raining, car wheels rotating, etc at same time. how can i do this with sketchup and max combined. model is complete in skp. I'm importing from CAD. I've got a lot of polylines with heights and thicknesses. When I try to use a bump map or displacement map on the linked object, it doesn't work. It's as though the normals are 'inside the solid'. Any thoughts, ideas, suggestions? Cheers. You can also use http://babel3d.com to translate SketchUp files to 3DS. Try it out! Disclaimer : I am the Product manager of Babel3D, and would also like to hear your feedback about the service. Using this method is it possible to UVW map different parts of the model with different settings? (Talking about using the UVW map modifier for individual materials). Thanks for sharing your experience. I have been working with 3ds max for years, but doing 75% of the modeling in SketchUp is one of my dirty little secrets. Don't tell ;-) I'll look forward to seeing new posts from you! Im currently using sketchup to develop structures for a video game im working on, but when my artist goes onto unwrap the model, he says that the faces are split up and require them to be reconnected, plus alot of additional triangles are formed when not needed, please advise. 1. I think I've seen this before. Not sure how much geometry is in your scene, but if your artist is finding split faces on meshes, they can select all of the vertices and use the weld tool in the modifier tab to connect your faces. 2. If you're using Max 2010 or newer you can import .skp files straight from Max without doing an export from SU. The advantage is that mesh vertices will be welded (I think). But what is even better is that it imports UV's from SU. So if you have rough materials as blocking in SU, when you import it will also import UV scale and direction on your mesh. I have 3DS Max 2010, and I cannot find how to import the sketchup .skp files anywhere. Can you explain exactly how to do this? Hi Ramy! Very inspiring blog! I love sketchUp but I find that curved geometry gets segmented a lot on a large radius. Is there a way to get a smooth curve from an imported sketch file? I exported my sketchUp file as a dwg format and imported it to Max. I tried using the smooth modifier with no luck. Please help! When you create your curve or circle in SU, you can specify how many segments it has before you created it. Ex: choose circle, then notice at the bottom right/left how it says 12 (i'm guessing). Typically SU defaults to 12 segments for arcs. You can change it to whatever you want. But once that geometry is created you can't segment it more. Hi! Congratulations with ur post to start. I have one problem with vray renderer on 3ds while importing a .skp file. The materials don't render with the maps but just with a solid colour. Do you think that exporting as .3ds resolves the issue? exporting as .3ds will not solve this. This sounds like something else. Be sure your materials are vraymaterials if you're rendering with vray. I am running 3ds max 2012 and am fairly inexpierenced. I have drawm my model in sketch up, followed your steps, and exported the model. When opening in max the objects are split seperatley with the correct materials applied, perfect. 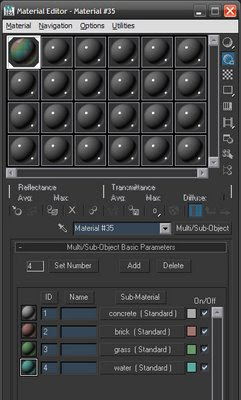 I open the slate material editor, hit material along the top and hit 'get all scence materials', perfect. However this is where I get stuck, and its really holding me up. It is my understanding that one should use MR materials where possible, as in Arch and Design, to produde the best render. All I can imagine doing here is changing the materials I have already applied in skectup to have a map of somesort, is there no way of making these MR materials? as in fresh materials? I am really sorry but I get really stuck at this point, but it is really holding me up. I just know how important it is get the materials right. From this point I know how to apply a daylight system, lights and set up the render, but all the time I do this at the momment it just looks really basic as the materials are weak. I'm so close to giving up and trying Vray but with the new Iray in max I really want to get this to work where I have a realativley realistic image at the end. Thanks Ramy, P.S I still do not know what a shader is or sub ojects so please keep it basic. Also if you could suggest any other posts that might help me achieve a good external daytime render I would be most grateful. My field is architecture. Baston, if you're using max 2012, there is now a better way to get your SU file into 3dsmax. Simply open max, and import your SU file. It will retain your textures, and materials will come in as arch & design materials. I have now completed my sketch up model and have imported it into 3ds max design 2012 as you said with the materials already applied, its works great they all come in as arch & design. The problem that I am having now is that the new materials I apply do not render or view in the viewport with any texture, just the colour, for instance the grass is just a green colour, please help? I have imported the model and all works great. I am having a small but frustrating problem thou. All the materials, which are arch and design, some replaced with autodesk materials, are not displaying any texture of the map just the colour, for instance the grass is just a green colour. This not only happens in the viewport but also in the render. Any ideas? I'm guessing this is referring to geometry that was created in 3dsmax after the import has taken place. The geometry may not be showing the textures because it has different UV texture coordinates than than the objects with the texture from SketchUp. Try applying a UVW modifier to the geometry to get the textures to layout at a better scale. I have not created any new geometry in 3ds. After importing the the sketch up model, I begin replacing and editing the arch & design materials, however as mentioned the materials have no texture, just a shade. One thing I have noticed is that in material slate, the image of the material map has a texture, but the primary material it connects to does not have any texture, this leads me to think it is a setting within the material it self? I will attempt the UVW modifier and let you know how I get on. Thank you for the advice. I see what your saying now. Be sure before you import your .skp file that the material you have in sketchUp has some type of texture map applied to it, even if you are going to change it later. This way when it imports into 3dsmax you won't have this texture problem, because sketchup has already defined the texture space for the material. Ramy. Thanks for your help. I have been running tests all evening and what I think I have worked out is that adding textures in sketchup makes no difference, but what I have discovered is that in 3ds max, when changing the material to an 'autodesk material libary' material, the render and viewport do not texture but instead create a shade, however the mental ray 'Arch & Design' and mental ray 'Autodesk' all seem to work ok. I read somewhere that for the best results you should aim to always create Arch & Design materials, so hopefully this will push me in a better direction. I do agree that sketchup is faster and easier for modeling but ONLY ARCHITECTURE. When it comes to animation involving organic forms cars helicopters etc. In a hunch, making small animated movie, sketchup cannot be compared to MAX. And that's why I always use max. I do agree that Sketchup is alot faster and User friendly when it comes to ARCHITECTURAL MODELING. For organic modeling, car modeling, animation you simply cannot compare sketchup to max. Which is why I will always use max. Someone Help me Please Thank You! I still havent overcome the no texture problem, despite what I said earlier I still have the problem with arch and design materials. I find the only way around the problem is to apply a UVW modifeier to the object which is fine however it changes the real world scale of the map, why is this? I dont mind apply UVW mods. to all the objects but it would be great to get to the route of the problem, and it seems it is just creating me new problems with map scales. I could send you my skecthup and 3ds models if you were interested? Another thing: does importing su directly or exporting to 3ds retain the model's layer? In my office, we use layers because we are constantly updating our projects, so we only import the layers we want. BTW, wouldn't it be great if there was a script that locked max's materials and modifiers to layers so that we could import updated parts and don't have to reassign materials and modifiers all the time? Do you think that exists or someone could write it? Thanks for this thorough info. I have struggled for days and weeks trying to find the best method with which to link the two applications. Your adapted method is by far the most informative. I am a landscape architect and realize that clients relates much better to photorealistic imageries, because they can actually place themselves in the images. Hence, I have been teaching myself 3Ds max for the past month, on and off. There are definitely alot of modeling features that are faster in 3dsmax. There are also modeling features in SketchUp that I wish 3dsmax could handle. I definitely go back and forth between the two though!